If you are looking for some other things to do at Carnarvon Gorge other than bush walking, then we can definitely point you in the right direction. One of the first places we stopped at was the Carnarvon Gorge Discovery Centre. The Discovery Centre is located just at the front of the Carnarvon Gorge Wilderness Lodge. The Centre is housed in a gorgeous old stone and timber building. It has a high pitched roof and a huge open fire place for those chilly winter nights. Here you can learn about the geological history of Carnarvon Gorge as well as the abundant species of flora and fauna that the area is home to. There is a fantastic and interactive display inside the centre as well. At 4.30pm every day an information talk is given by Australian Nature Guides which covers a lot of what you can expect on your walks. I found it much easier to plan my walk after attending this informative talk. Michelle is so very knowledgeable about the whole of Carnarvon Gorge and loves sharing that knowledge with visitors to the park. All this is available for just a gold coin donation. Just a small section of the fantastic display inside the Carnarvon Gorge Discovery Centre. Australian Nature Guides are accredited Savannah Guides and the only dedicated guided tour company operating in Carnarvon Gorge. If you truly want to experience all the Gorge has to offer you can do a guided Lower Gorge Walk. Other walks are also available. Or for a really unique experience why not go on a Night Safari like we did. 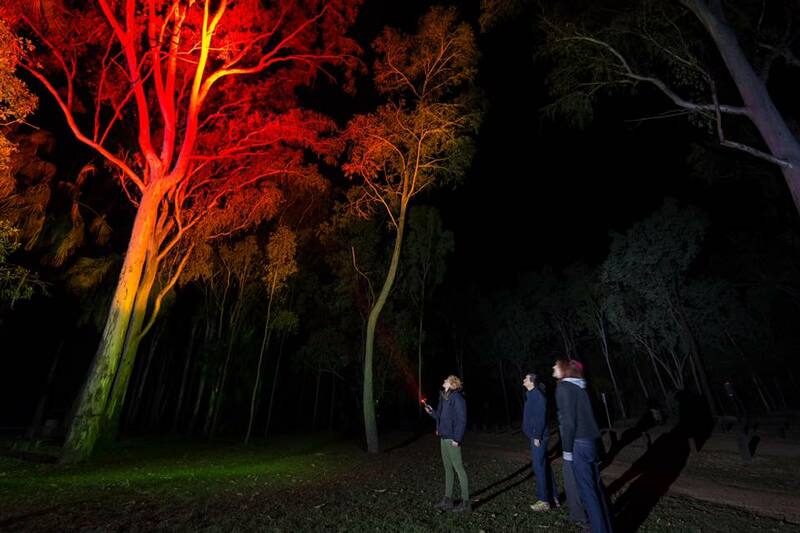 During the tour we were taken around the Visitors Area of Carnarvon Gorge on the hunt for a variety of nocturnal animals. Carnarvon Gorge is home to five different species of glider and we were lucky enough to spot four out of the five species and saw three of them gliding which was a real thrill! It was incredible to see a yellow-bellied glider, a sugar glider, feather tailed glider and the metre-long greater glider. The yellow-bellied glider in particular is very unique. It is very social and makes a lot of noise whilst it is gliding. It likes to let everyone know where it is. The tour goes for about and hour and a half and is suitable for anyone. Night time temperatures can be chilly, even in September so you will need a warm jacket. Binoculars are provided but you will need a small torch (not a headlamp) just to guide your way in some places. All this costs just $25 per adult which we thought was great value. If you fancy treating yourself to a spot of lunch then the Carnarvon Gorge Wilderness Lodge has a café and restaurant. The café is open from 10.00am and the restaurant is open in the evenings and bookings are essential. We decided to treat ourselves to lunch and a cold beer and the meal was delicious. I had a Tuscan Chicken Burger and Brenden had a Fillet Steak Burger. Both meals came with fat, crispy chips. The deck of the café is lovely and shady and the perfect spot to enjoy morning tea as well. Also if you need to check your emails or social media then they have Wi-Fi available as well. Take a break from all that walking and enjoy lunch at the Carnarvon Gorge Wilderness Lodge. For those who don’t camp or caravan, accommodation is also available at the Wilderness Lodge. To book a tour with Australian Nature Guides you can call into their office inside the Carnarvon Gorge Discovery Centre or visit their website HERE. To stay at the Carnarvon Gorge Wilderness Lodge or to find out more information about their cafe and restaurant you can visit their website HERE. You have made me want to see this place even more, if that’s possible! It really does have a lot to offer the nature lovers. You will love it Kathy. Such a beautiful place.